Replacing the traditional competitive multiplayer, Unity features a range of co-op missions. Assassin's Creed: Unity is the eight installment in the Assassin's Creed series and the first to appear only on eighth generation consoles and PC. It was released on November 11th, 2014 for Xbox One, PlayStation 4, and PC. Set in Paris in the year 1789, the game features a new protagonist in Assassin Arno Dorian as he embarks on an epic journey during the French Revolution. 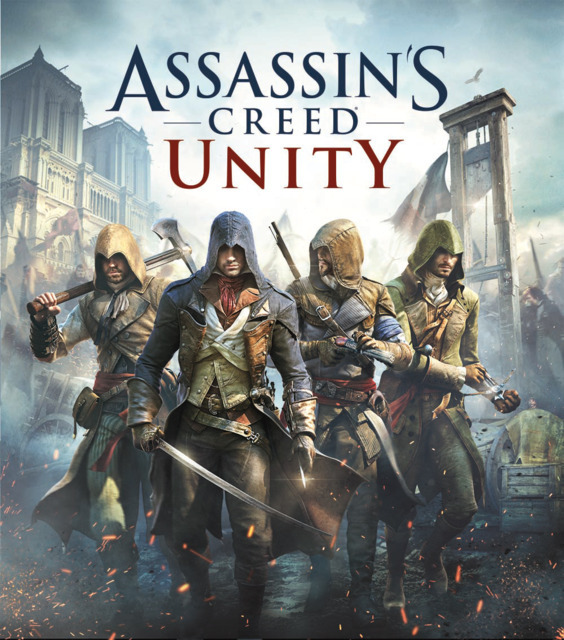 Taking place a few years after Assassin's Creed: Rogue, released the same day, the end of Rogue leads into the beginning of Unity, tying the stories together. Similar to recent releases in the series it uses the Anvil Next engine. Several weeks after it's release, amid complaints that the game contained an excessive amount of bugs and glitches the Season Pass was removed from sale, with purchasers of the pass being given the lone DLC, The Dead Kings, to be released as well as a choice of one other Ubisoft game from a selected list of recent or soon to be released games. Assassin's Creed Unity Involves World War II?